2005 EPPIE Award Finalist for Best Young Adult! "You're going to cross the Sahara Desert? It's dangerous. They rob tourists and slit their throats..."
Nick Bridger reluctantly joins his news correspondent father in the Sahara Desert. He scoffs at his friends' worries. He thinks the expedition to film the nomadic Tuareg tribesmen--the Blue Men--will be boring...but he soon discovers it is dangerous and deadly. When Nick and his father are deserted by their guides, and then his father breaks his leg, Nick must go for help. Alone and inexperienced, he loses direction and becomes lost in the hottest place on earth. About Allan Serafino (Author) : Allan Serafino is a published author of young adult books. 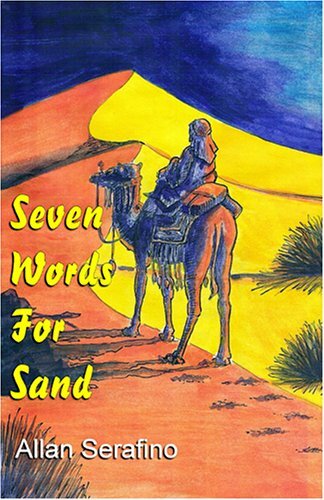 Published credits of Allan Serafino include Seven Words for Sand and Blood Jaguar.